Centre for Stem Cell, Tissue Engineering and Biomedical Excellence, Panjab University, Chandigarh - 160014, Chandigarh, India. ABSTRACT: Regular intake of carbohydrate diet containing high fructose or sucrose increases adipogenesis resulting in conditions like weight gain, high blood pressure, elevated blood glucose levels, insulin resistance, raised triglycerides, low HDL cholesterol, with metabolic syndrome as a leading consequence. 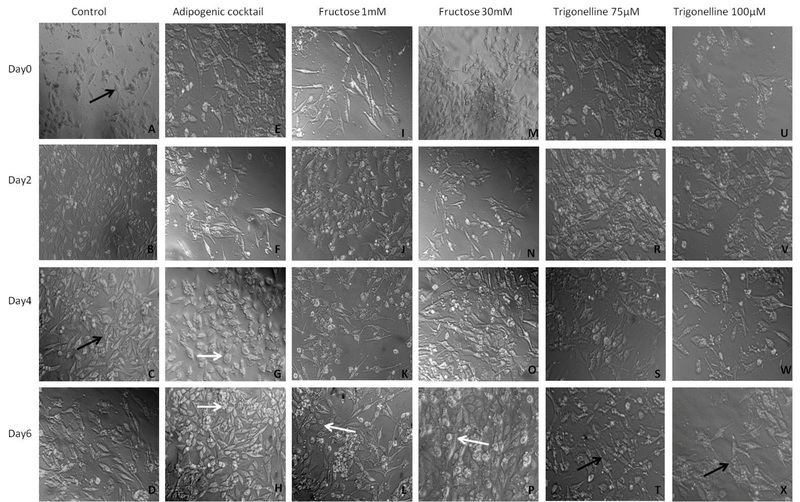 Since intricacies of adipogenesis are of major relevance to human health; present study aimed to evaluate the morphological effects of trigonelline on mesenchymal stem cells, C3H10T1/2 treated with high fructose (equal to that in high fructose corn syrup) in comparison to the adipogenic cocktail. In this regard, cells were given trigonelline alone as well as in combination with an adipogenic cocktail or high fructose to evaluate its potential to affect adipogenesis morphologically. The cells of positive control (containing only adipogenic differentiation media) depicted morphological changes towards spherical structure, a feature definite of adipocytes. 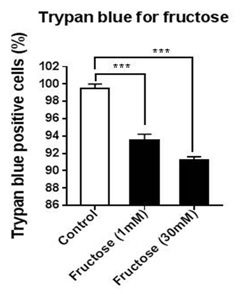 Similar observations were seen in cells treated with high fructose (1 mM and 30 mM) but not in cells treated with trigonelline alone (75 μM and 100 μM). However, the cells treated with high fructose along with trigonelline or adipogenic cocktail with trigonelline depicted less change in morphology, as it was more like fibroblast than globular. The morphological changes were observed in a dose-dependent manner. 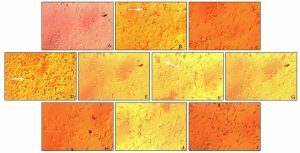 Morphological assessment of scratch assay revealed trigonelline did not alter cellular proliferation alone or in combination with high fructose. Moreover, oil red O staining of trigonelline treated cells showed less adipocytic like cells suggesting its ability to interfere with adipocytic differentiation of mesenchymal stem cells. INTRODUCTION: Metabolism plays a crucial role in ascertaining whether a cell differentiates, proliferates, or stays in dormancy and certain metabolic conduits are associated with the determination of cell fate 1. Moreover, metabolic modulation of stem cells can maintain stem cell potency or can direct stem cell differentiation into specific cell types 1, 2. Carbohydrate metabolites have become the hot research focus in recent years about human health with potential health effects of sucrose, high-fructose corn syrup (HFCS) and fructose itself being the prime considerate. HFCS increasingly has been used in various processed foods and soft drinks, and its regular intake shows increased adipogenesis with clinical manifestations like obesity, diabetes, dyslipidemia, and metabolic syndrome (MetS) in both rodents and humans 3, 4. There is a high prevalence of obesity and related metabolic syndromes in urban Indian subjects with socio-economic (high educational and occupational status) and lifestyle (high-fat diet, low physical activity, overweight and obesity) factors playing prime roles with no definitive cure 5. As per Third National Cholesterol Education Program-Adult Treatment Panel (NCEP ATP III) criteria, central obesity is the commonest abnormality among females and elevated blood pressure among males 6. Also, India is estimated to be among the top 3 affected countries concerning the absolute number of diabetic people 7, 8. How metabolic changes affect differentiation and hence related diseases, remains unclear, studies analyzing metabolism about cellular differentiation and disease onset in stem cells are of immense importance. Therefore present study used adipogenic differentiation as a paradigm to study the effects of high fructose and trigonelline (an alkaloid and active component of fenugreek, onions, potato, peas, hemp, soybeans, cantaloupe, corn, etc.) on mesenchymal stem cells to assess morphological changes that occur in response to the differentiation induction. Trigonelline has been known to exhibit medicinal properties like inhibition of adipocyte differentiation 9, anti-carcinogenic 10, 11, 12, anti-hypercholesterolemia 13, anti-diabetic and hypoglycemic 13, 14, 15, antioxidant 10, 16, anti-apoptotic 17 activities and may help to prevent or at least increase the age when one suffers from obesity and associated effects. Reagents: All the chemicals used in the study were of the molecular grade. Dulbecco’s modified eagle medium (DMEM)/F-12, penicillin-streptomycin, phosphate-buffered saline (PBS), fetal bovine serum (FBS), trigonelline were obtained from Sigma-Aldrich chemical company, Saint Louis, (Missouri) the U.S.A. Cell Culture: Murine mesenchymal pluripotent stem cell line C3H10T1/2 was procured from National Center for Cell Science, (NCCS, Pune, Maharashtra, India) and cells were maintained in growth medium (DMEM, 10% FBS, 100 μg/ml penicillin/streptomycin). Cells were plated in six-well plates at a density of 1 × 105 cells per well. An adipogenic medium including 0.1 μM dexamethasone and 5 μg/ml insulin was added on day zero. For the 7-day experiments, the adipogenic medium was replaced every day. Adipogenic Differentiation Dosage: Adipogenic differentiation dose viz. Isobutyl methyl xanthine IBM-X (0.5 mM per well), Dexamethasone (1 uM per well) and insulin (5 μg/mL per well) were used 18. Fructose Dosage: Fructose was prepared (w/v) in autoclaved distilled water and working concentrations of 1 mM and 30 mM. Trigonelline Dosage: Trigonelline was prepared (w/v) in autoclaved distilled water, for working concentrations of 75 μM and 100 μM were used. Dosage Regimen: Dosage regimen for trigonelline, fructose, adipogenic cocktail, and their combinations is mentioned in Table 1. It was followed for six consecutive days, and on the seventh day, Oil Red O staining was performed. Trypan Blue Exclusion Test: Trypan blue was added to trypsinized cells, loaded onto a hemocytometer and cells were viewed under a microscope. MTT-Assay: Cells were plated at a density of 10,000 cells per well. Respective dosages - fructose and trigonelline were added in the wells, and the protocol of van Meerloo 19 performed MTT assay. Reading was taken at in 570 nm ELISA. Scratch Assay: Cells were plated in a six-well plate, and incubated for 24 h at 37 ºC allowing the cells to attach and spread in the wells. A confluent layer of C3H10T1/2 cells was scraped, and respective doses of the adipogenic cocktail, fructose dosage, and trigonelline doses were added, cells were observed and photographed for the next three consecutive days. Oil Red-O Staining: For Oil Red-O staining, C3H10T1/2 cells were fixed with 4% formaldehyde in PBS for 10 min., washed with PBS and dried. After Fixation, cells were stained with Oil Red-O staining solution for 20 min at room temperature, followed by thrice washing with PBS. Cells were allowed to dry completely and photographed 20. Statistical Analysis: Where applicable, Statistical analysis was performed using one-way analysis of variance (ANOVA). Data were represented as the mean ± standard error of the mean (n=4). Statistical significance of the results was calculated at p<0.05. RESULTS: Mesenchymal stem cells, C3H10T1/2 exhibit fibroblast-like morphology and have the characteristic of differentiating into cell types of mesodermal lineage 21. Therefore, in the present study adipogenic differentiation potential of high fructose (equal to that in HFCS) in comparison to adipogenic cocktail and anti-adipogenic potential of trigonelline were studied and their effects on C3H10T1/2 cells were determined microscopically. Trypan blue dye exclusion test for fructose and trigonelline treated cells Fig.1 a, b and MTT assay of mesenchymal stem cells treated with fructose (1 mM and 30 mM), adipogenic cocktail (comprising of IBMX, Dexamethasone and insulin) and trigonelline (75 μM and 100 μM) Fig. 2 revealed that respective doses were not cytotoxic to the cells as survival potential (viability) of C3H10T1/2 cells post-treatment was not affected and was comparable to that of control. Dose-responsive effect of fructose was observed on mesenchymal stem cells by administering different doses of fructose (1 mM and 30 mM). Adipogenic cocktail treated cells were used as a positive control. Photographs at day 0, day 2, day 4 and day 6 were captured to analyze the morphological alterations and was observed that C3H10T1/2 cells differentiated into adipocytic like globular cells in a dose (more spherical cells in 30 mM fructose treated well) and time (as seen on day 4 and 6, figure) dependent manner by fructose as compared with adipogenic dose Fig. 3. 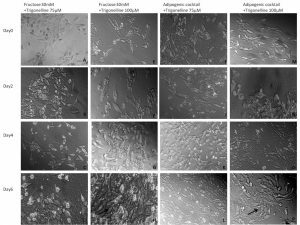 On the other hand, mesenchymal stem cells treated with trigonelline (75 μM and 100 μM) retained their characteristic spindle shape during experiment (six days) with both the doses. 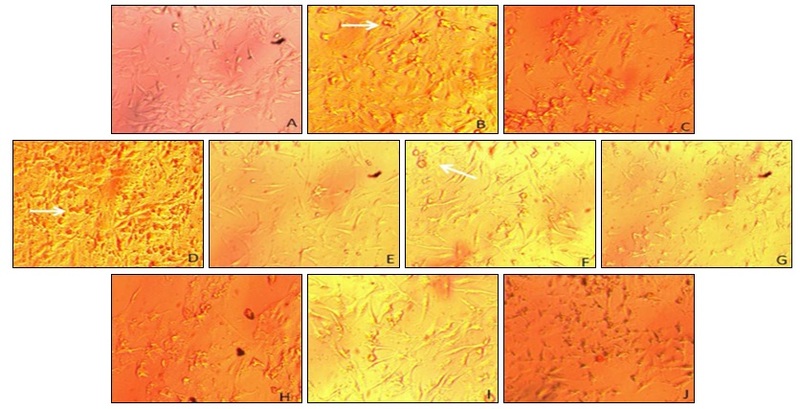 Further, dose-responsive effect of trigonelline (75 μM and 100 μM) was studied on adipocytes produced from differentiation of C3H10T1/2 cells by adipogenic cocktail and fructose independently. The cells of positive control (containing only adipogenic differentiation media) as observed on day 6 exhibited morphological changes towards globular structure, a key feature of adipocytes. However, microscopic examination of cells with concurrent doses of trigonelline and fructose depicted that fibroblast morphology of C3H10T1/2 cells was maintained, and they did not exhibit morphological change towards globular like even in the presence of fructose and adipogenic cocktail Fig. 4 suggesting differentiation inhibitory potential of trigonelline. Furthermore, the effect of various treatments was analyzed on mesenchymal stem cell proliferation via a scratch assay. Post confluency, cells were scratched and treated with different doses of trigonelline in combination with fructose or adipogenic cocktail. Pictures were captured to analyze the rate of cell migration for over 3 days. 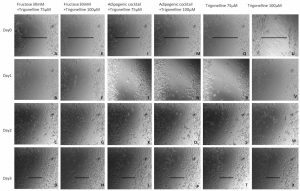 Microscopic examination of scratch assay showed that cell migration was not affected by trigonelline and was similar in cells treated with trigonelline alone or in combination with adipogenic cocktail or fructose. The width of scratch created was approximately 2.4 cm which reduced to approximately 1.3 cm on day 4th in all the treatments suggesting cellular migration or proliferation of stem cells was not affected by trigonelline Fig. 5. FIG. 6: OIL RED O STAINING (10X). CELLS WERE TREATED AS MENTIONED BELOW AND STAINED TO CHECK LIPID ACCUMULATION. The white arrow indicates globular cells stained with oil red O. To ascertain the differentiation of C3H10T1/2 towards adipocytic lineage by high fructose/ adipocytic cocktail and counter effect of trigonelline, cells were stained with Oil Red O stain on the 7th day of respective treatments. The Oil Red O staining showed positive staining (red stain) in high fructose treatment (30 mM). However, wells with concurrent treatments of trigonelline and high fructose or adipocytic cocktail showed negligible staining with Oil red O stain Fig. 6. Though the cells treated with adipocytic cocktail were of globular morphology (as seen in Fig. 4B), few cells were stained with oil red O on the 7th day and may require more days for a complete accumulation of oil droplets by adipocytic cocktail (insulin, dexamethasone, and IBMX) in C3H10T1/2 22. These observations, though preliminary hint towards the ability of trigonelline to halt/delay differentiation of mesenchymal stem cells towards adipocytes. DISCUSSION: Intensive sugar consumption is increasingly measured as a key contributor to the worldwide epidemics of obesity and diets high in fructose have been shown to produce all of the key features of obesity and metabolic syndrome 23, 24, 25, 26, 27, which is becoming a leading cause of death globally 28. There is an obvious interplay of various factors in the onset and progression of obesity, however, metabolism being a crucial one plausibly due to sedentary or so-called modern lifestyles and thus has become a matter of immediate concern. Stem cells exert precise regulation to maintain a balance of self-renewal and differentiation programs to sustain tissue homeostasis throughout the life of an organism. Recent evidence suggests that this regulation is modulated, in part, via metabolic changes 29, 30. Therefore, understanding metabolism during cellular commitment towards adipocytes might prove a vital cog in resolving associated obesity disorders. Adipocytes arise from mesenchymal precursors whose commitment and differentiation along the adipocytic lineage is tightly regulated 31, 32. An inability of adipose tissue to expand consequently to its exhaustive capacity results into the recruitment of new adipocytes which might underlie an over-stimulation of endogenous mesenchymal stem cell pool to differentiate into adipocytes resulting in obesity and related disorders 33. Hence, for understanding the increased adipocyte formation, the effect of fructose (by simulating the concentration as present in high fructose corn syrup) was studied on the differentiation of mesenchymal stem cells in the present study. Postprandial fructose concentration is 1mM (hence used as one of the doses in the present study), and it is achieved when a large amount of fructose is ingested, e.g. 20-oz soft drink containing 32.6 g fructose would increase serum fructose concentration in this range 34. Furthermore, HFCS commonly present in packed food items has 55% fructose and 45% glucose 35, which was simulated by 30 mM fructose in the present study. In the present work, MSC was differentiated into adipocytes using adipogenic cocktail which comprises of IBMX, dexamethasone, and insulin. A previous work lends support to this observation where it has been shown that 3T3 preadipocytes in this differentiation medium resulted in adipogenesis 36. Before understanding the effect of fructose (1mM and 30 mM) on mesenchymal stem cells, its cytotoxicity was evaluated by MTT assay to check whether it would facilitate the growth of the stem cell pool. It was found that concentrations of fructose used in the present work were not cytotoxic to C3H10T1/2 cells and validated the use of fructose for further study on differentiation. Both doses of fructose were observed to change the morphology of C3H10T1/2 cells from typical fibroblast-like to a rounded phenotype during the experiment and were comparable to differentiation induction caused by adipogenic cocktail which is known for adipogenic differentiation of stem cells 36. In a previous study, it has been reported that fructose can be efficiently utilized by 3T3-L1 preadipocytes and, as the only carbohydrate source, is sufficient for the induction of adipogenic gene expression and the terminal differentiation of adipocytes 37, and in accordance with this, in the present study, fructose, when used with glucose (4.5 gm/L in media) in ratio similar to that, found in HFCS (55% fructose and 45% glucose), the MSC cell line C3H10T1/2 showed globular like cellular morphology in a time-dependent manner. Additionally, in conjunction to this, earlier studies have reported that at high concentrations of fructose, i.e. 1 and 4.5 g/L, the transport of fructose exceeds far than that of glucose, while at low concentration (0.1 g/L), uptake of glucose is more efficient than fructose 37, further linking the notion that metabolism is cardinal for cell fate. In the present experiments, fructose was added even at a higher concentration which simulates the concentration of HFCS i.e. 5.4 g/L (30 mM) while the glucose present in the media was 4.5 g/L (25 mM) which proposes that transport and uptake of fructose might be more under such conditions as also been suggested by a previous study 31. It further lends support from the fact that fructose leads to higher glucose transporter 5 (GLUT5) expression in 3T3-L1 adipocytes which is responsible for uptake of fructose 36, further corroborating the role of fructose in cellular differentiation. Moreover, Oil Red-O staining at days 4 and 8 of differentiation of 3T3 have been shown to be positive with fructose 36. Hence, based on these observations, collectively, it can be corroborated that differentiation into adipocytic like cells were induced by high fructose rather than glucose. The fact that HFCS results in deregulated adipogenesis of MSC causing various metabolism associated disorders with devastating consequences and no definitive cure, anti-adipogenic properties of natural compounds present a great potential and can be exploited till a definitive cure is identified. In orders to analyze individualistic effect, C3H10T1/2 cells were cultured in the presence of 75 μM and 100 μM trigonelline alone (a natural component of many days today food items like onions, potato peas, hemp, soybeans, cantaloupe, corn, and coffee) after confirming it to be non-cytotoxic by MTT assay. It was observed that it maintained their fibroblastic morphology, indicating that it has antiadipogenic potential. Trigonelline has been shown to inhibit adipocyte differentiation 9, thus supporting present observation. Moreover, it also exhibits properties like anti-diabetic activities 14, anti-hyperlipidemic and hypo-cholesterolemic activity 13, further revealing its potential to act against associated metabolism disorders. 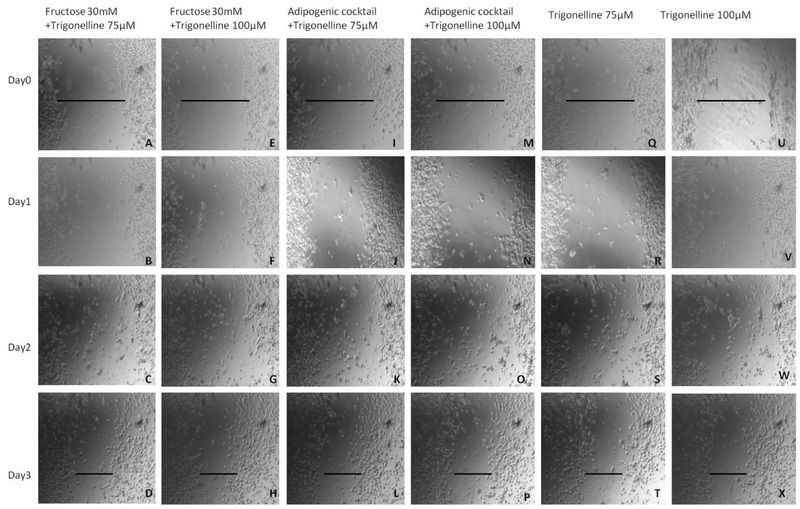 Furthermore, the combinatorial effect of trigonelline in the presence of fructose or adipogenic cocktail was studied, and it was observed morphologically that in the presence of trigonelline (75 μM and 100 μM), most of the cells maintained their characteristic fibroblast morphology. In a similar study, trigonelline prevented adipogenesis and cytoplasmic lipid accumulation in 3T3-L1 adipocytes at both 75 μM and 100 μM concentrations 9. It has also been documented that these concentrations do not disturb the normal cellular proliferation as compared to control 9, and similar microscopic observation was seen by scratch assay where migration rate of cells across the scratch was comparable in all the treatments in the present work. CONCLUSION: Overall, these results suggest that high fructose concentration in the presence of glucose induces adipocyte like globular cellular morphology in mesenchymal stem cells and an alkaloid, trigonelline can confine this induction. Since this is a preliminary study and employed microscopy as a tool for morphological assessment of various treatments, future molecular studies are required for confirming the role of high fructose in differentiation pathways. Moreover, being more efficient and having fewer side effects, consumption of natural compounds is the new line of treatment for diseases with no ultimate therapy as they have a multitude of medicinal value. The present study also sheds light on the fact that trigonelline has the potential that can be exploited for as a treatment regimen in adipogenesis associated diseases. 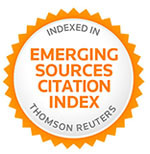 ACKNOWLEDGEMENT: This research was carried out by the infrastructural and technical support from Centre for Stem Cell Tissue Engineering and Biomedical Excellence, Panjab University, Chandigarh, and is duly acknowledged. Shyh-Chang N, Daley GQ, Lewis C and Cantley LC: Stem cell metabolism in tissue development and aging. Development 2013; 140: 2535-47. Zhang Y, Marsboom G, Toth PT and Rehman J: Mitochondrial respiration regulates adipogenic differentiation of human mesenchymal stem cells. PLoS One 2013; 8: 77077. Bursac B, Djordjevic A, Velickovic N, Milutinovic DV, Petrovic S, Teofilovic A, Gligorovska L, Preitner F, Tappy L and Matic G: Involvement of glucocorticoid pre-receptor metabolism and signaling in rat visceral adipose tissue lipid metabolism after chronic stress combined with high-fructose diet. Mol Cell Endocrinol 2018; S0303-7207(18): 30134-5. Legeza B, Marcolongo P, Gamberucci A, Varga V, Banhegyi G, Benedetti A and Odermatt A: Fructose, Glucocorticoids and Adipose Tissue: Implications for the Metabolic Syndrome. Nutrients 2017; 9(5): E426. Deedwania PC, Gupta R, Sharma KK, Achari V, Gupta B, Maheshwari A and Gupta A: High prevalence of metabolic syndrome among urban subjects in India: a multisite study. Diabetes Metab Syndr 2014; 8(3): 156-61. Third Report of the National Cholesterol Education Program (NCEP) Expert Panel on Detection, Evaluation, and Treatment of High Blood Cholesterol in Adults (Adult Treatment Panel III) final report. Circulation 2002; 106(25): 3143-421. Anjana RM, Pradeepa R, Deepa M, Datta M, Sudha V, Unnikrishnan R, Bhansali A and Joshi SR: ICMR–INDIAB Collaborative Study Group. Prevalence of diabetes and prediabetes (impaired fasting glucose and/or impaired glucose tolerance) in urban and rural India: phase I results of the Indian Council of Medical Research-India diabetes (ICMR-INDIAB) study. Diabetologia 2011; 54(12): 3022-27. Arun R and Lokesh S: A study of carotid intima-medial thickness among diabetic and non diabetic patients and its association with the vascular complications - a Compa-rative Int J Biol Med Res 2013; 4(2): 3078-83. Ilavenil S, Arasu MV, Lee JC, Kim da H, Roh SG, Park HS, Choi GJ, Mayakrishnan V and Choi KC: Trigonelline attenuates the adipocyte differentiation and lipid accumulation in 3T3-L1 cells. Phytomedicine 2014; 21(5): 758-65. Jeong Y, Kim DH, Chung KD, Kim YH, Lee YS and Choi KC: Antitumor activity of trigonelline-incorporated chitosan nanoparticles. J Nanosci Nanotechnol 2014; 14(8): 5633-37. El Bairi K, Ouzir M, Agnieszka N and Khalki: Anticancer potential of Trigonella foenum graecum: Cellular and molecular Biomed Pharmacother 2017; 90: 479-91. Goyal S, Gupta N, Kumar A, Chatterjee S and Nimesh S: Antibacterial, anticancer and antioxidant potential of silver nanoparticles engineered using Trigonella foenum-graecum seed extract. IET Nanobiotechnol 2018; 12(4): 526-33. Khound R, Shen J, Song Y, Santra D and Su Q: Phytoceuticals in Fenugreek Ameliorate VLDL Overproduction and Insulin Resistance via the Insig Signaling Pathway. Mol Nutr Food Res 2018; 62(5). Aldakinah AA, Al-Shorbagy MY, Abdallah DM and El-Abhar HS: Trigonelline and vildagliptin antidiabetic effect: improvement of the insulin signaling J Pharm Pharmacol 2017; 69(7): 856-64. Joanna F, Aleksandra J, Maria P, Urszula C, Leszek L, Zora K, Kornelia Sand Martin G: Effects of Trigonelline, an Alkaloid Present in Coffee, on Diabetes-Induced Disorders in the Rat Skeletal System. Nutrients 2016; 8(3): 133. Chowdhury AA, Gawali NB, Munshi R and Juvekar AR: Trigonelline insulates against oxidative stress, proinflammatory cytokines and restores BDNF levels in lipopolysaccharide-induced cognitive impairment in adult mice. Metab Brain Dis 2018; 33(3): 681-91. Antonisamy P, Arasu MV, Dhanasekaran M, Choi KC, Aravinthan A, Kim NS, Kang CW and Kim JH: Protective effects of trigonelline against indomethacin-induced gastric ulcer in rats and potential underlying mechanisms. Food Funct 2016; 7(1): 398-08. Miyawaki J, Kamei S, Sakayama K, Yamamoto H and Masuno H: 4-tert-octylphenol regulates the differentiation of C3H10T1/2 cells into osteoblast and adipocyte lineages. Toxicol Sci 2008; 102(1): 82-8. Van Meerloo J, Kaspers GJ and Cloos J: Cell sensitivity assays: the MTT assay. Methods Mol Biol 2011; 731: 237-45. Ruan B, Zhu Z, Yan Z, Yang W, Zhai D, Wang L, Ye Z, Lu H, Xiang A, Liang J, Jiang Y, Xu C, Wang Z, Wei M, Lei X, Cao X and Lu Z: Azoramide, a novel regulator, favors adipogenesis against osteogenesis through inhibiting the GLP-1 receptor-PKA-β-catenin pathway. Stem Cell Res Ther 2018; 9(1): 57. Reznikoff CA, Brankow DW and Heidelberger C: Establishment and characterization of a cloned line of C3H mouse embryo cells sensitive to postconfluence inhibition of division. Cancer Res 1973; 33(12): 3231-8. Scott MA, Nguyen VT, Levi B and James AW: Current Methods of Adipogenic Differentiation of Mesenchymal Stem Cells. Stem Cells Dev 2011; 20(10): 1793-04. Elliott SS, Keim NL, Stern JS, Teff K and Havel PJ: Fructose, weight gain, and the insulin resistance syndrome. Am J Clin Nutr 2002; 76(5): 911-22. Gaby AR: Adverse effects of dietary fructose. Altern Med Rev 2005; 10(4): 294-306. Cigliano L, Spagnuolo MS, Crescenzo R, Cancelliere R, Iannotta L, Mazzoli A, Liverini G and Iossa S: Short-Term Fructose Feeding Induces Inflammation and Oxidative Stress in the Hippocampus of Young and Adult Rats. Mol Neurobiol 2018; 55(4): 2869-83. Crescenzo R, Cigliano L, Mazzoli A, Cancelliere R, Carotenuto R, Tussellino M, Liverini G and Iossa S: Early Effects of a Low Fat, Fructose-Rich Diet on Liver Metabolism, Insulin Signaling, and Oxidative Stress in Young and Adult Rats. Front Physiol 2018; 9: 411. Crescenzo R, Mazzoli A, Di Luccia B, Bianco F, Cancelliere R, Cigliano L, Liverini G, Baccigalupi L and Iossa S: Dietary fructose causes defective insulin signalling and ceramide accumulation in the liver that can be reversed by gut microbiota modulation. Food Nutr Res 2017; 61(1): 1331657. Khitan Z and Kim DH: Fructose: a key factor in the development of metabolic syndrome and hypertension. J Nutr Metab 2013; 682673. Ochocki JD and Simon MC: Nutrient-sensing pathways and metabolic regulation in stem cells. J Cell Biol 2013; 203(1): 23-33. Drehmer DL, de Aguiar AM, Brandt AP, Petiz L, Cadena SM, Rebelatto CK, Brofman PR, Filipak Neto F, Dallagiovanna B and Abud AP: Metabolic switches during the first steps of adipogenic stem cells differentiation. Stem Cell Res 2016; 17(2): 413-21. Kim SP, Ha JM, Yun SJ, Kim EK, Chung SW, Hong KW, Kim CD and Bae SS: Transcriptional activation of peroxisome proliferator-activated receptor-gamma requires activation of both protein kinase A and Akt during adipocyte differentiation. Biochem Biophys Res Commun 2010; 399(1): 55-59. Q Chen, P Shou, C Zheng, M Jiang, G Cao, Q Yang, J Cao, N Xie, T Velletri, X Zhang, C Xu, L Zhang, H Yang, J Hou, Y Wang and Y Shi: Fate decision of mesenchymal stem cells: adipocytes or osteoblasts? Cell Death Differ 2016; 23(7): 1128-39. Christodoulides C, Lagathu C, Sethi JK and Vidal-Puig A: Adipogenesis and WNT signaling. Trends Endocrinol Metab 2009; 20(1): 16-24. Bohannon NV, Karam JH and Forsham PH: Endocrine responses to sugar ingestion in man. Advantages of fructose over sucrose and glucose. J Am Diet Assoc 1980; 76(6): 555-60. Johnson RJ, Segal MS, Sautin Y, Nakagawa T, Feig DI, Kang DH, Gersch MS, Benner S and Sanchez-Lozada LG: Potential role of sugar (fructose) in the epidemic of hypertension, obesity and the metabolic syndrome, diabetes, kidney disease, and cardiovascular disease. Am J Clin Nutr 2007; 86(4): 899-06. 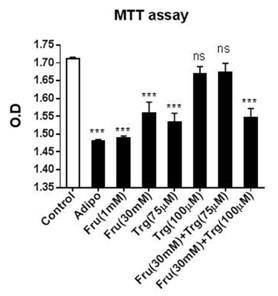 Legeza B, Balazs Z and Odermatt A: Fructose promotes the differentiation of 3T3-L1 adipocytes and accelerates lipid metabolism. FEBS Lett 2014; 588(3): 490-6. Halperin ML and Cheema-Dhadli S: Comparison of glucose and fructose transport into adipocytes of the rat. Biochem J 1982; 202(3): 717-21. Mahajan N, Raina K and Gupta A: High fructose induced adipogenesis and inhibitory potential of trigonelline on murine mesenchymal stem cells: a morphological study. 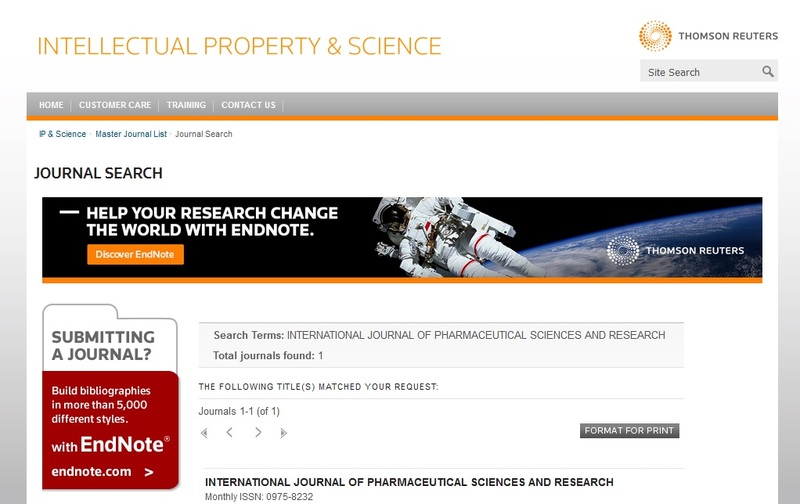 Int J Pharm Sci & Res 2019; 10(2): 528-36. doi: 10.13040/IJPSR.0975-8232.10(2).528-36. Authors Address: Centre for Stem Cell, Tissue Engineering and Biomedical Excellence, Panjab University, Chandigarh, Chandigarh, India.